In this lesson, we will learn how to calculate changes in the energy of an object in a gravitational field using the definition of the gravitational potential energy, E = mgh. 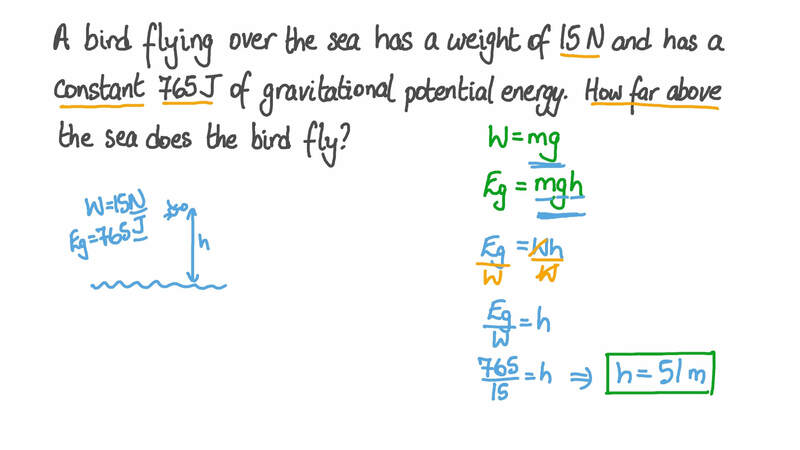 A bird flying over the sea has a weight of 15 N and has a constant 765 J of gravitational potential energy. How far above the sea does the bird fly? A woman walks along a bridge, holding in her hand a small cell phone with a weight of 0.75 N. The phone is held at a height of 1.2 m above the surface of the bridge. The bridge is 4.3 m above the surface of a river. How much greater is the gravitational potential energy of the phone held in the woman’s hand on the bridge than the gravitational potential energy of the phone at the surface of the river? A speck of dust with a mass of 0.22 g is at a distance of 1 250 m from a tiny shard of ice that has a mass of 1.5 g. Both of the objects are located in deep space, extremely far away from any stars or other objects of any kind. The gravitational force that the objects exert on each other is negligible, as is the gravitational force on either the speck of dust or on the shard of ice from any other objects. What is the gravitational potential energy of the speck of dust? What is the gravitational potential energy of the shard of ice? An object with a mass of 10 kg is positioned 15 m above the surface of an unknown planet. The object has 1 8 0 0 J of gravitational potential energy. What is the acceleration due to gravity at the surface of the planet? An object held at a point above the ground has 2 3 5 2 J of gravitational potential energy. The object’s mass is 20 kg. How far above the ground is the object? An object with a mass of 15 kg is at a point 10 m above the ground. What is the gravitational potential energy of the object? The quantity ℎ is the vertical displacement of an object from a given position. The quantity 𝐸 is the object’s gravitational potential energy. Which of the following formulas correctly shows the relationship between ℎ , 𝐸 , the mass of the object, and the acceleration of the object by gravity? An apple that hangs from a tree branch 4.5 m above the ground has a weight of 1.2 N. What is the apple’s gravitational potential energy? An object held at a point 1.5 m above the ground has 1 1 7 6 J of gravitational potential energy. What is the mass of the object? A room contains a book, a chair, a bookshelf, and a hatch that leads to a basement, as shown in the diagram. The book has a weight of 7.5 N. The seat of the chair is 0.45 m above the floor of the room, the bookshelf is 1.5 m above the floor of the room, and the basement floor is 2.2 m below the floor of the room. The book is placed in various positions and its gravitational potential energy changes depending on its position. How much can the gravitational potential energy of the book decrease if the book is released from a point on the floor of the room, to the left of the hatch? How much can the gravitational potential energy of the book decrease if the book is released from a point on the floor of the room, to the right of the hatch? How much can the gravitational potential energy of the book decrease if the book is released from a point at the height of the chair seat? How much can the gravitational potential energy of the book decrease if the book is released from a point at the height of the bookshelf? The hatch is opened, and the chair is moved next to the hatch. A reader sits on the chair and holds the book at the height of the chair seat, but over the open hatch. How much can the gravitational potential energy of the book decrease if the book is released from this point? The chair is moved so that it sits on the basement floor. The reader sits on the chair and holds the book at the height of the chair seat. How much can the gravitational potential energy of the book decrease if the book is released from this point? The hatch is opened, and the book is moved vertically from being on the floor of the basement to being at a point that is at the same height above the room’s floor as the bookshelf. How much does this increase the gravitational potential energy of the book?